"I believe in individuality. I am inspired by organic materials as they speak to me. It is all about the experimental. I design extreme objects, bold and beautiful, pieces of sculpture rather than jewellery that create breathtaking statements. "I started making two dimensional objects at the end of 2006 and my first collection was carried by Holt Renfrew. Reinventing myself has been the most challenging and rewarding decision I have ever taken after I decided I needed more creative freedom. My jewellery and accessories reflect my passion for organic elements and is very influenced by my long career as a graphic designer --(School of Visual Arts, New York, graduated with honours, The School of Visual Arts Rhodes Family Award for Outstanding Achievement in Media Arts) as I had my design company for many years in Bogota--. 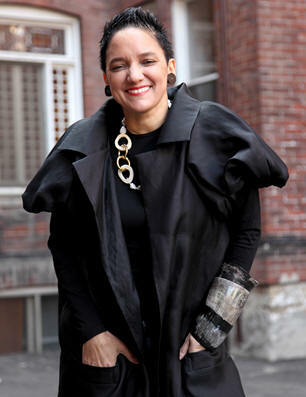 Rated an accessories genius and A-list by fashion magazines, Colombian-born, Toronto-based Dandi Maestre is a visionary. Her large-scale works are crafted from organic materials such as antlers, bull horn, rough amber and emeralds, reclaimed wood, natural seeds and nuts, elements found on shores, in rivers, jungles and forests. "Taking nature as my inspiration, I continue to explore organic shapes found in bone and driftwood, in shed antlers and amber, in coconuts and bull horns, in natural fibre and seeds, in rough emeralds and crocodile skins, in skulls and shells. I love their forms and their natural raw beauty. "Through my work, I want to create a dialogue with the natural world. Each one of my pieces is handmade from elements found in shores, rivers, jungles and forests. I incorporate these shapes in my designs and make very large extreme pieces with a natural look and a flowing and curving appearance, with a minimum of industrial processes. I aim to elevate organic elements, their natural color and textures to a new level of sophistication - (a combination of the Japanese design philosophy wabi-sabi: which nurtures all that is authentic by acknowledging three simple realities: nothing lasts, nothing is finished, and nothing is perfect). "My designs show a very strong mix of naïve and urban cultures. Born in Colombia, based in Toronto, my work is clearly influenced by my travels, and profoundly by my respect of indigenous and tribal cultures around the world. My collection grows every season and is never outdated. "